Four clowns from Caring Clowns International traveled with a team of 13 craniofacial surgeons, neurosurgeons, anesthesiologist and scrub techs to Lima, Peru where the medical team performed much needed surgeries. Duffy, Flora, Flossy and Sparkles entertained many children, their families and the hospital staff at the 700-bed Instituto Nacional de Salud del Nino. The US medical team members are all part of Komedyplast. They all volunteer their time and pay their own way to make these trips. They have completed over 210 surgeries; this is the group’s 13th mission to Peru. Komedyplast is a one-of-a-kind nonprofit, because they focus on correcting complex facial anomalies, in addition to doing cleft lip and cleft palate corrections. During the week, the surgeons performed 16 surgeries, many of which were full facial reconstructions requiring long seven to nine-hour surgeries. The four clowns clowned all day our first Saturday there, during “screening day,” when the Doctors take a last look at kids for potential surgeries for the following week. While families are waiting, the clowns entertain the children and adults. 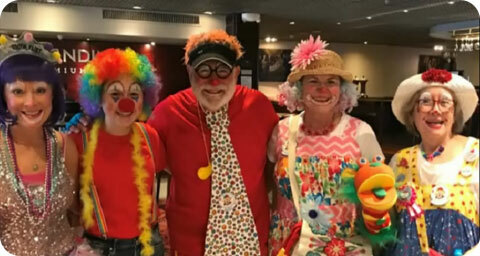 Joining the Caring Clowns at screening day were newbie clowns Bubbles, Cupcake, Curlee and Red. 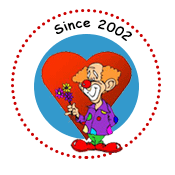 The newbie clowns included the daughter of one of the members of Komedyplast as well as her friends. This year, the U.S. Ambassador to Peru, Mr. Krishna Urs visited with the medical team and doctors during screening day. He was joined by several hospital and Peruvian health officials. While the Doctors were in surgery, the clowns not only went bed-to-bed throughout the 700 bed children’s hospital but also spent time in the chemo unit and outside in the hospital courtyard.